Our Exclusive Mobile Application “Ahl uz Zikr” was launched in Shahrullaah 1437 AH by the Razaa of Huzoor e ‘Aali Saiyedna saheb TUS in the Khidmat of Mumineen. Since its launch, there are currently 1800 users registered on our Application. With the passing time Application needs to be updated according to the needs of the Mumineen. More than 250 notifications (messages) were sent to the Mumineen through our Application. Notifications are messages related to Deeni Ma’loomaat, Akhbaar, Audio Messages, Video Links etc. 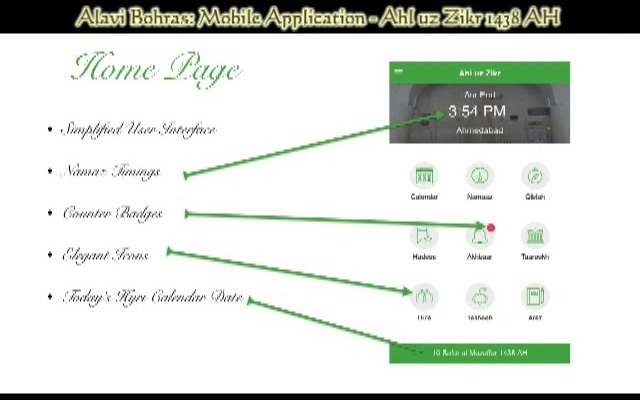 Huzoor e ‘Aali TUS, in Moharram 1438 AH, has said in his Bayaan that Ahl uz Zikr Mobile Application will become the main medium of connectivity between Da’wat e Haadiyah and the Mumineen. We will gradually encompass and add all necessary features for the Mumineen. Ahl uz Zikr will become the prime source of Deeni Knowledge for the Mumineen apart from our community website. Looking at the wide acceptance of Mobile phone among the Mumineen, we need to keep our Application up to date and rich in features. We got many feedbacks from the Mumineen regarding the Features that need to be added in the future updates. We have taken into consideration all those feedbacks. Insha-allaah our Mobile Application will undergo Major Changes with respect to its User Interface and addition of New Features. Taareekh – History: This feature will include complete detailed history from Maulaana Aadam SA till our present Da’i e Mutlaq Saiyedna Haatim Zakiyuddin Saheb TUS. Mumineen will know our complete History through this feature. All text will be in Lisaan ud Da’wat – the language which we speak in our homes, but in English Script which will make it readily acceptable and readable to the Mumineen Worldwide who don’t know how to read Gujarati script. Example – Maulaana Aadam SA Allaah Ta’aala na Pehla Nabi chhe… To get easy access, it will be divided into various sections and categories. Historical accounts will be added gradually. Hadees: This feature will include all Ahaadees (Pl of Hadees – Sayings of Rasoolullaah (SAWS)) which we believe in. It will encompass the whole book of Da’aaim ul Islaam covering all Seven Pillars of Islaam. It will Insha-allaah be the most comprehensive work done till date. It will be in the same script as Taareekh. Apart from Ahaadees, it will cover all our Beliefs, Principles, Tenets and Aqeedah. The main source of this feature will be the Da’wat Books. This feature will quench the thirst of Mumineen who are in search of Ahaadees we believe in. Du’aa and Tasbeeh: This feature will cover all our Du’aas and Tasbeeh which we recite in the Namaaz and after it, as well as those which are recommended for us by A’immat-e- Faatemiyeen SA and Du’aat-e-Akrameen RA. This feature is already there on the Website, but here it will be dealt with different approach. 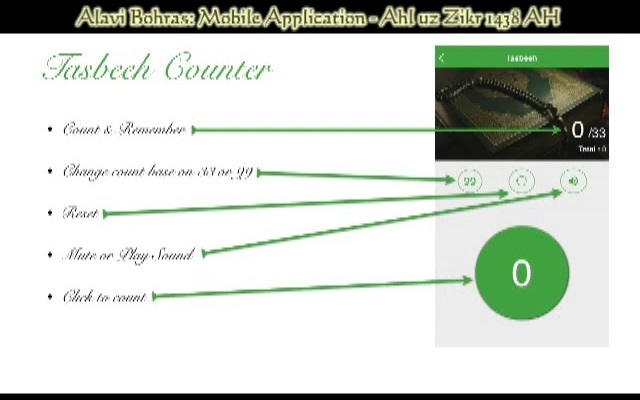 Tasbeeh Counter: With this simple feature, Mumineen will be able to do Tasbeeh by keeping a count of it by the counter. Mumineen will be able to do Tasbeeh for 33, 99 or for other specific count. It will have a sound feature which Mumineen will be able to put OFF while they are in the Masjid. Classifieds: Mumineen will be able to post Advertisements through our Application. It is a paid feature. Mumineen will have to pay for posting the Advertisements of their Businesses, Profession, Shops, Skills, Home products or any such thing. Charges of Advertisement will be announced through the Application. Messages: Mumineen were receiving all messages at one place till now. In the new Update, messages will be classified into 6 categories – Deeni, General, Elaan, Classifieds, Video and Urs. Users were unable to delete the messages till now but with the new update, Users will be able to delete the messages or add them “as a Favourites”. All Images, Audio Clips and other Media will be stored in a separate folder in the user’s device from where it can be shared through other mediums. Calendar will be updated with dates in English. Nawaaru will be added. Conversation: Till now Mumineen were doing Araz to the Saheb-e-Da’wat for any question or requesting something. Apart from Araz, a new feature of Conversation will be added in the next update where Mumineen will be able to see the whole conversation as a thread. 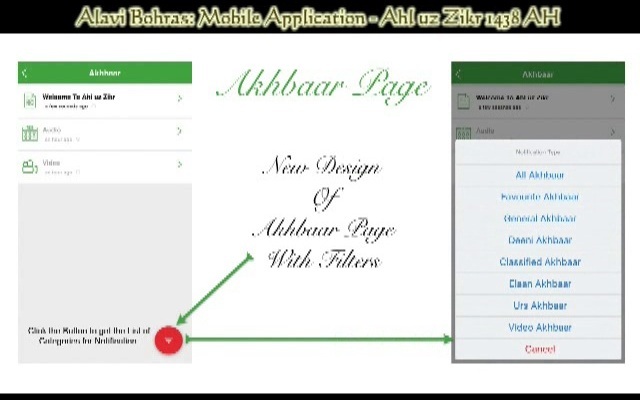 In Shahrullaah 1437, we the TEAM ALAVI feel very much elated the by the Razaa Mubaarak of Huzoor e 'Aali TUS we are launching our community’s much awaited Mobile App named “Ahl uz-Zikr” on Android. After registration mumineen would get Deeni Messages, Photos, Audio, Video and Different Akhbaar. Concerned mumineen are hereby directed by the Farmaan of Huzoor e 'Aali TUS to Download the Newly Launched Mobile App “Ahl uz-Zikr” as early as possible. Till now the Audio clips on Different Topics in the Lisaan Mubaarak of Huzoor e 'Aali TUS has been broadcasted regularly in number of WhatsApp Groups by Markaz-e-Da’wat. But from now on Ahl uz Zikr, the same pattern of Audio clips will be published weekly on Friday. With the Du’aa Mubaarak of Huzoor e'Aali TUS, Team Alavi is glad to announce the Launch of "Ahl uz Zikr" App on iOS platform. As per the farmaan of Huzoor e'Aali TUS, now the Akhbaar and Broadcast from the Office of Da’wat e Shareefah will be carried out on this App. Also the social medium like Facebook and Whatsapp will not be used any more. After the Download you will get approval from the Administrator for using it. On using the App, user is requested to go through "Important Instructions for iPhone Users" in Notifications carefully.